This detailed volume collects numerous methods and protocols related to different aspects of stability programs that are followed in pharmaceutical development laboratories. 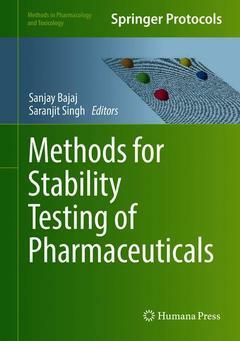 Implementation of a successful stability program, vital in preventing product failures and recalls, requires critical and logical thinking that goes beyond the regular documented protocols and methods, so the experiences of the book?s internationally-based expert contributors fill the chapters with practical guidance. As a volume in the Methods in Pharmacology and Toxicology series, this book presents the kind of real-world advice that is essential for advancing laboratory research.